Home » Uncategorized » Introducing Our New Help Desk! Introducing Our New Help Desk! We’re thrilled to announce the brand new support.shoeboxed.com! Please make sure to use the new Help Desk for all new support requests, as we will be discontinuing our previous Help Desk and email support system within a couple days. Power Tip: When you’re submitting a new support request, check the right side of the box– you may see an answer to your question pop up as you type! 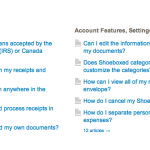 We think this is one of the best new features on support.shoeboxed.com, and we think you will too. We sincerely hope you will find our new Help Desk, well, helpful!